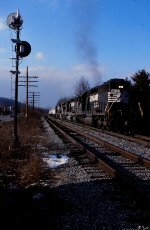 Description: NS 6113 leads an RPPY south from East Binghamton yard. 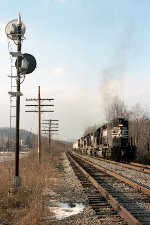 Description: The ex DLW south of Binghamton had some scenic places. One was near the overpass connecting NY 7 to Kirkwood near Broome Corporate Park, where we see RPPY running along the ice choked Susquehanna. Description: A quartet of NS units leads RPPY as it gets out of the south end at Terrace Dr. Description: Prior to CP takeover, the double track south of Binghamton extended through Conklin, almost to the PA line. The approach signal for the end of this segment was at Stillwater Rd at the far south end of Conklin. RPPY approaches at 10 MPH, slowly making its way toward Pennsyvania. Description: NS SD40-2 6113 working in the Norfolk Southern yard at Columbus, Ga. The building in the background is the former Swift Textiles mill. Date of photo is not accurate. 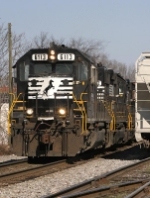 Description: NS Westbound Local Freight Train at Decatur, Al. Description: An NS train led by UP 6303, with 6113 in tow, races to Bellevue with a green signal clearing it's way. Description: A coal train for the Ithaca Branch has arrived at the old LV yard in Sayre where the power will run around and head up the branch to Milliken power plant. Description: Now a helper on V92, she will soon be the trailing unit of 55Q. Description: 55Q, pulling 4 MofW cars and empty grain cars gets the go ahead from the C&W yard office to proceed at 0800. Description: To your left is an on looker; One of the city bus drivers while on his break, enjoys the view. Description: NS 350 notches up at Lexington after stopping to crank up his fourth unit, NS 2912. These four old soldiers are a welcome sight to see pulling road trains in 2008. Description: T-44 idles next to a cut of cars from the T-71. Description: NS train T44's power waits on the rails to clear ahead before heading on to C'nooga. Description: My favorite NS unit other than the NS 2593. Description: NS V40 rolls out of the east end of the yard and onto the siding to head east and do some work. Description: NS V40 working its way out of the yard with a burned out ditchlight on their lead unit. Description: NS T50 blasts through a crossing somewhere between Frisco and Mt. Carmel.